Nas Haddad finds it difficult to find fashionable clothes that fit appropriately. Growing up in Germantown, marketing consultant Nas Haddad found himself sticking to an all-black color palette for most of his outfits as a matter of function, not fashion. It wasn't that he hadn't developed the curiosity to explore bold colors and patterns, but mostly because such styles weren't available in a size that fit his body comfortably. Haddad, like many men, has simple needs: find fashionable clothes that fit appropriately. But for his 6-foot, broad-shouldered, XXL frame, Haddad learned that shopping at accessible and reasonably priced retailers such as H&M and Forever 21 had a negative impact on his confidence. "It [messes] you up," Haddad said. "There are confidence issues and self-esteem issues that come from shopping [with a larger frame]. It's always about fitting into the clothes. Sometimes I'll get clothes that may not necessarily fit right, and I'll have to lose the weight to fit it." Adolescent boys struggle with body image as much as girls do, but body-positive messaging is much more pronounced among women due to years of conversations on inclusivity in fashion. "Now, with the advocacy of so many women coming forward and saying, 'Listen, this is my body. I like it as is. I cannot get skinny. It's just who I am. I love me,' it's given men this room to also have a conversation about self-love, too," says London-based men's fashion editor and stylist Geoff Cooper. "However, [self-love] is not really translated into men's fashion." According to the U.S. Centers for Disease Control and Prevention, the national waist size for adult men in 2017, age 20 and over, is 40, yet companies such as Zara and Abercrombie & Fitch offer up only to size 36 and 38 on their websites, respectively. Simply constructed trousers or well-tailored blazers can often be difficult to find in stores because traditional size runs have a limited quantity of larger-sized items. In addition, when stores do carry XLs and above, rarely do the cuts of the garments account for larger biceps or thigh circumferences, resulting in an unflattering fit. South Jersey-based model Darnel Ghramm, 32, said he's shopped at big-and-tall stores such as Destination XL, but felt that the clothes were more conservatively styled. 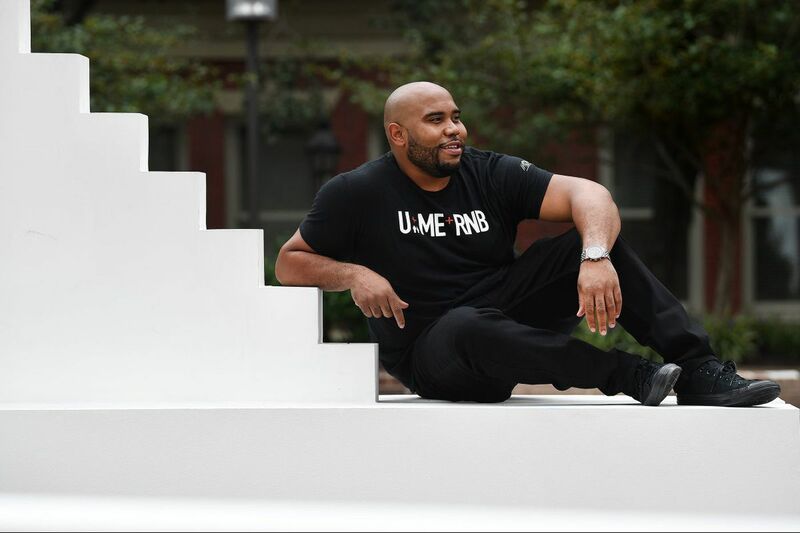 "Based on what's available in stores, there's still a misconception of what a male should look like," said Ghramm, who will be walking for Volare France, a brand that caters to plus-sized men, at Philly Fashion Week. "He should be 6'1, 6'2. He should have a 34-inch waist. It raises a question of who's setting these standards. We have quite a ways to go with that." It's undeniable that men with larger bodies feel insecure when shopping, and to complicate matters even further, representation of larger men is sparse. "We need to see ourselves," said Kevin Parker, founder of Philly Fashion Week, which takes place this week. Some brands do offer up to 3XL, but very rarely do those same brands book full-figured models for campaigns and advertisements. "I get insecure because a lot of the times I can't find things in my size," Parker said. "I have to travel far or choose different items to find clothes that really fit me. A lot of the men I surround myself with are on the heavier side, and we feel unappreciated [by designers] because we can't find anything to wear. So we often find ourselves working out, trying to get our bodies fit because of what society tells us what we should look like." For social media influencer Emeka "Soouizz" Okeke, shopping from mainstream brands isn't worth the trouble. While Soouizz may be fashion-savvy enough to navigate retail spaces, he wants more high-end brands such as Gucci to align with the trend and introduce sizes above an XL. The fact that influencers and stylists such as Soouizz — including Ghramm — can exist alongside smaller-bodied people challenges traditional portrayals of the male body, and consequently, highlights a market of men that has been overlooked by designers for years. Similarly to Cooper and Parker, Soouizz doesn't believe that the fashion industry exists without its foibles. But Soouizz's approach to redefining the public image of the male physique is driven by showing rather than telling — a form of activism in and of itself. With his 40-inch waist and 3XL frame, Soouizz uses his growing Instagram platform of 15.8 thousand followers and counting to show how larger men can style themselves in a heightened way with his use of vibrant color and pattern mixing — two techniques that are typically reserved for slimmer frames because of availability. Ultimately, Soouizz's shopping perils were reconciled through a deeper understanding of self-love, which he believes is the gateway to confidence. "It took a whole lot," Soouizz said regarding his journey to believing that his body was worthy of high-fashion. "It wasn't about the clothes. It was about how I carried myself," Soouizz said. "If a smaller dude is wearing the same clothes that I'm wearing, it's nice. But you don't get to see as many of the details compared to me. So I had to come to terms with the idea that bigger is better. And now I feel like I haven't had a bad-outfit day in a while." Cooper is hopeful that brands will market to a larger-framed man in the future because of sheer competition. But with such brands as ASOS, Bonobos, Fashion Nova, and Chubstr making strides toward the intersection of high-fashion and inclusivity with their collections catered to men of a particular size, more designers are understanding the value of this demographic. "We're seeing that people are being pushed to create. Yes, it can be frustrating but you figure out a way. You have to be inclusive in 2018," Cooper said. "So one of two things is going to happen: new brands popping up all the time or established brands will say, 'There's a market here of men who are upwardly mobile and have the money to afford our clothes; we need to start creating for them.'"